Bali Jungle Trekking Adventure is an exciting trekking adventure to bring you to the wonderful experience on your holiday in the Jungle Mountains of Bali. We will take you to the peaceful place where is far away from bustle, re-siding in the middle of jungle which is fully planted by multifarious flora and fauna. The rainforest Bedugul Bali provides the fresh air with colorful panorama. The dense forest is the home of many kinds of birds and other fauna, which live harmoniously in their habitat. Some of the places of interest in Bali where you can visit like Bedugul, Beautiful Rice Field or traditional Balinese Village as in accordance with your trekking selection. 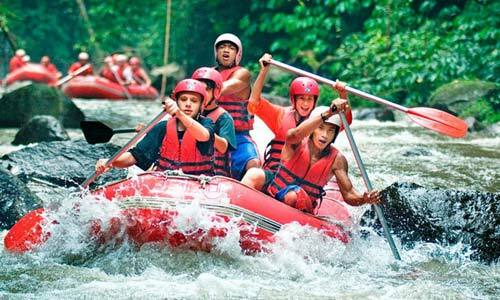 Your holiday will be completely unforgettable one if you have this experience in Bali. Bali Jungle Trekking Adventurre will start from pick you up at the hotel and arrive at the starting point at Bedugul forest to get the short briefing. Your trek begins by descending the steps to an ancient temple guarding the entrance to the timeless beauty of virgin rainforest that is part of Bedugul Village. Venturing into another world under the canopy of enormous trees we encounter the wide variety of flora thriving in this unique environment, many kinds of birds and other fauna, which live harmoniously in their habitat. Multifarious of habitat life and close forest and also the big tree will become the very marvelous view. Along your trekking adventure, you will be accompanied by an experienced and professional guide to explore the forest and see direct the life of flora and fauna. Multifarious of habitat life and close forest and also the big tree will become the very marvelous view. Your adventure is continued to step and trace the forest beside beautiful and calm lake. Your trekking atmosphere will feel enjoyable residing in the middle of jungle owning very cold and fresh air. Your journey is continued experience crossing the calm lake waters with a traditional dugout canoe. The delicious lunch have been prepared at the same time enjoy the beautiful view of Bedugul making your trek exotic full of memory. It is situated adjunction to Buyan Lake with cool weather surrounds it. It owns the fascination where the nature authenticity is felt and the inexistence of boat use motorize here. This lake is ideal for Jungle Trekking Adventure because it was very amazing with the rain forest including flora and fauna observation. Is one of the means of transportation used to get to the forest from the main road, canoeing in tamblingan lake is the experience that will never be forgotten in this adventure. A Long way of the forest you will find the amazing and hide beautiful natures of Bali. Explore the forest and see direct the life of flora and fauna. Multifarious of habitat life and close forest and also the big tree will become the very marvelous view. Inside of the forest will have change to see the hug and high canopied trees, enormous, and climbing plants. This forest is also rich of bird, monkeys, squirrel, butterfly and more. 07.30 Pick up time at Kuta, Nusa Dua, Sanur Area. 08.00 Pick up time at Ubud Area. Please do not hesitate to send us Whatsapp Text +628124661446 or contact us if there information that we provide is not clear.